Yesterday, something insanely exciting happened. 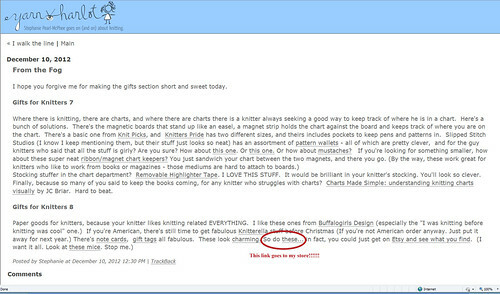 One of my favorite authors, Stephanie Pearl McPhee (aka The Yarn Harlot) writes a yearly “gifts for knitters” post for her blog (which if you don’t read already, you really should! It’s insanely entertaining, particularly if you are at all interested in knitting) and she included my Knitted Teacup Note Cards! I will have to admit to some fangirl shrieking and dancing about the house when I saw that. She called my cards “charming!” My reaction to that may have gone something like this. It seriously made my day! This entry was posted in Ciarrai Studios, Crafts, Etsy, Knitting and tagged Ciarrai Studios, Etsy, Knitting, My Etsy Store, Yarn Harlot. Bookmark the permalink.